BIOBEST offers a new and further improved version of Dros’Attract, which has proven to be even more efficient in attracting Drosophila suzukii to the Droso trap. Droso trap with the new Dros’Attract formulation started catching the first Drosophila suzukii well before other attractants. This makes it an excellent attractant for monitoring purposes. 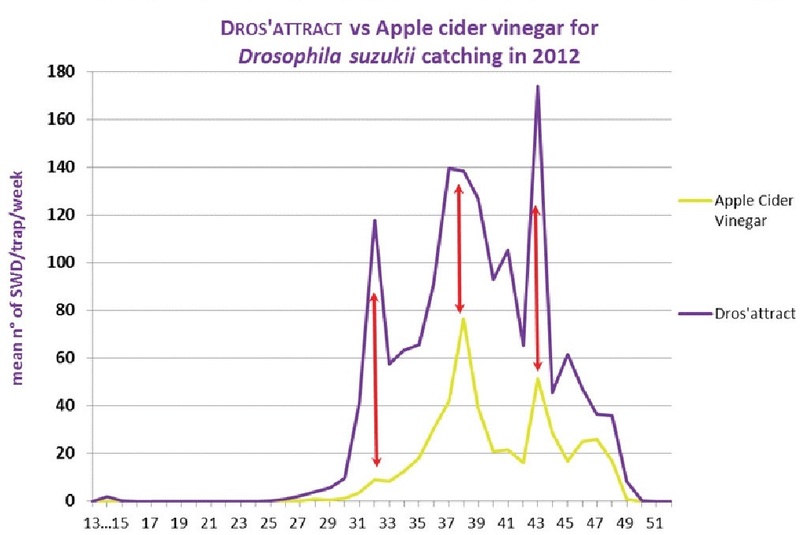 The new formulation caught on average 3.3 times more Drosophila suzukii than ACV (see graph below), with peaks where catch levels exceeded those of the standard attractant by up to a factor 10! For optimal results, Biobest recommends to put 200 ml Dros’Attract per Droso trap and add a sugar cube of 4-5 g. Furthermore, it is recommended that the attractant be renewed every 15 days. The new formulation is supplied in a practical 5L bag-in-box and is totally safe for users. Thanks to the tap you can easily fill the Droso trap with Dros’Attract and renew it.